If you’re traveling through San Fransisco International Airport or Portland International Airport anytime soon, keep an eye out for new art. 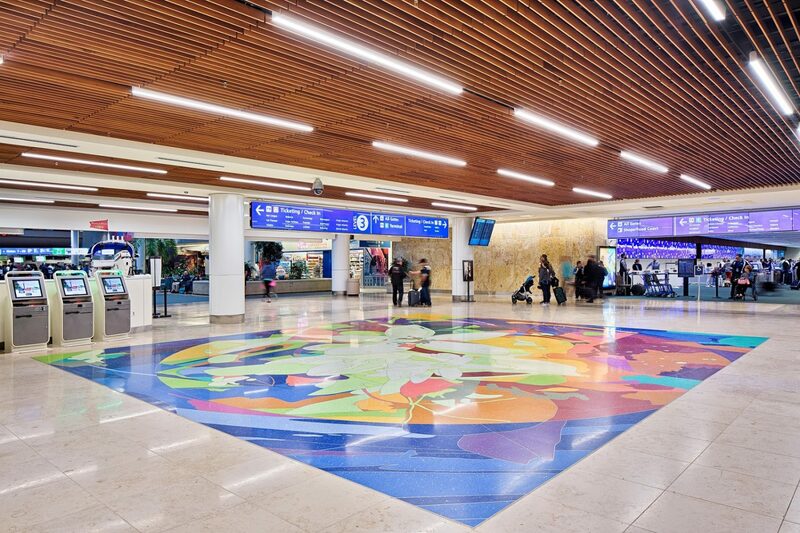 At Portland International Airport’s Concourse D, look up to see Portaurora, a new permanent art piece by Sticky Co., a Portland- and Amsterdam-based artist team. This is an interactive installation: as travelers pass underneath they’ll see colors and hear sounds inspired by the Northern Lights. At SFO Airport, the SFO Museum’s newest exhibition is all about artisan-made surfboards. Longyboard – Dudley “Hap” Jacobs. Courtesy SFO Museum. This exhibition features twenty-seven wooden surfboards made by surfboard artists – or “shapers” – that show the progression of surfboard design. Included are boards made from rare woods that represent surfing’s ancient history, boards that represent designs popular in the early 1960s and surfboard shapes best for paddling into large waves. The SFO Museum’s new exhibition: “Reflections in Wood: Surfboards & Shapers” will be on display in the pre-security area of the International Terminal at SFO International Airport through August 4, 2019. Next time you’re passing through Orlando International Airport, be sure to look at the floors in the north terminal. Not just so you don’t trip, but so you don’t miss the permanent art installation made up of four large-scale terrazzo murals by international award-winning artist Scott Parsons. The themes are wellness, fun, technology and space and included are images such as a roller coaster, a space shuttle and orange blossoms set amidst swirling splashes of color. Take a look at some of the mural details. Orlando International Airport has lots more great art to keep an eye out for in the terminals including more terrazzo floor murals and, a favorite of mine, this work by Duane Hanson called “The Traveler” in Terminal A.
Orlando International Airport also has this treasure: a work by Jacob Lawrence, titled Space, Time, Energy, in Terminal B. 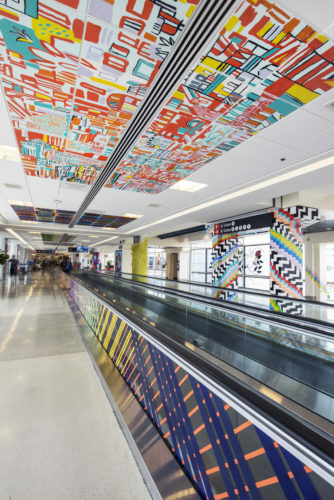 To mark the 20th anniversary of its locally-curated art program, Philadelphia International Airport asked 20 local artists to transform one previously art-free area of the airport into a colorful installation. The artists used used yarn, fabric, felt, found objects, tape, paint and vinyl and applied their work to the ceiling tiles, columns, rocking chairs, walls, walkway and windows. Now this part of Terminal A-East is an immersive and experiential art-filled passageway. “It’s a Wrap: 20 for 20” will remain on site through February 2019. Find out more about the wide array of art exhibits at PHL Airport online and take a look a some of the other art pieces created just for this art installation below.